SALT LAKE CITY (AP) — Kansas, with all its ups and downs this season, was a popular pick to be one of the NCAA Tournament’s first big upsets. The best shot for the 13th-seeded Huskies (23-11) was to make their 3-point tries. The Colonial Athletic Association champions went 6 for 28 from the arc after finishing the regular season 17th in Division I at 38.6 percent. Sharpshooter Vasa Pusica had a hard time getting separation from the Jayhawks’ athletic guards, finishing with seven points on 2-of-11 shooting. Jordan Roland had 12 points to lead the Huskies, who shot 28 percent overall. The Jayhawks had a regular season like few others in their storied history. Kansas made the NCAA Tournament. That was no shock. This was its 30th straight year in the bracket. But the Jayhawks were a No. 4 seed when they’re usually a 1 or 2. Kansas played all season without Silvio De Souza after he was connected to the federal probe into college basketball corruption. Center Udoke Azubukie was lost for the season in January to a wrist injury. Senior guard Lagerald Vick left the team for personal reasons in February. Self navigated the attrition the best he could, piecing together a lineup with four freshmen and a lineup no one could have predicted at the season’s start. The result: Kansas had its 14-year reign as Big 12 champions come to an end and was a trendy upset pick against the 3-shooting Huskies in the NCAA Tournament. Kansas gave them little chance. Northeastern was no match for Lawson inside and had a hard time stopping the Kansas guards off the dribble from the get-go. Lawson had 16 points by halftime and the Jayhawks led 37-25. The Huskies also needed to make 3-pointers to keep Kansas in reach and didn’t, going 5 for 17 in the first half. The trend continued to start the second half. Lawson hit a 3, scored inside and Kansas used a 16-2 run to go up 53-32. Northeastern got over a hump by bouncing back from a big disappointment in last year’s CAA tournament, but didn’t have the size or athleticism to keep up with the Jayhawks. Kansas did what it normally does as a high seed in the NCAA Tournament, stretching its opening-game winning streak to 13 games. Dedric Lawson was a preseason All-American and a matchup problem for teams all season. Pack it in and he’ll shoot outside. Leave him 1-on-1 in the post, he’ll wear his defender out. Northeastern, with one regular over 6-foot-8, certainly had no one who could contain him. Lawson made 9 of 16 shots, 3 of 5 from the 3-point arc and all four of his free throws. 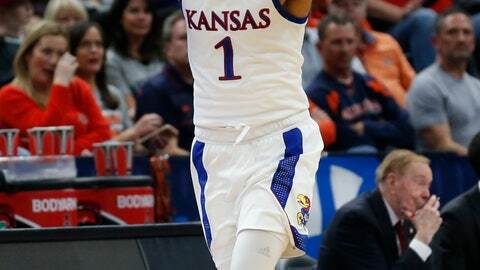 Kansas faces No. 5 Auburn in Saturday’s second round.